The hotel is situated in the picturesque and historic village of Aberdaron on the Llŷn Peninsula, North West Wales. 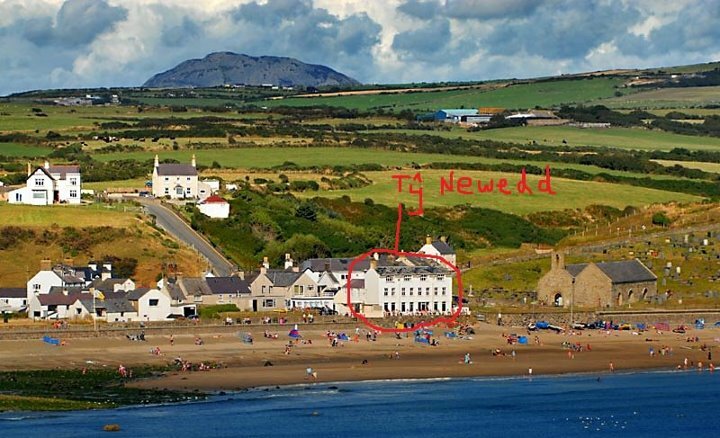 This hotel is rated 4 stars, and has absolutely beautifully amazing views over the Aberdaron Bay and out to Ireland (on a clear day). There is no private parking at the hotel: Instead, we had to use the public (gravelled and grassed) car park about 5 minutes walk and over the quaint bridge from the hotel. Normally, you would have to pay £9 per day(!!) to park here (non-secure and very “open”), but the hotel gave us a laminated sheet to dispay in the window to say we didn’t have to pay… (Just as well really). We were staying in room 6 “Parwyd”. This was a twin / double room (actually a twin with the beds pushed and zipped together creating a super king size bed!) with a full en-suite bathroom. A large room, bright and airy, and decorated rather plain but tasteful. The room had a small LCD TV mounted on the wall (I’d say about a 20″), and a kettle with tea, coffee, hot chocolate, cappucino and a packet of biscuits. Obviously, the hotel staff think that only one person would like a hot chocolate, a cappucino or a biscuit as there were only one of these! Otherwise, there were plenty of tea, ordinary coffee and milk pots. The room was also big enough for us to put up the travel cot for William, and not have to worry about collapsin it every day. The bathroom was beautiful. White washed walls and grey tiles (with underfloor heating!). There was a full-sized bath and overhead shower was really powerful (have to commend this). We were supplied with miniature bottles of shampoo and shower gel, although (because I’m fussy) we took our own. The windows from both the bedroom and the bathroom overlooked the sea. We watched dolphins from the bedroom on several occasions. The bar downstairs was much to be desired. It was constantly full of the locals, who obviously didn’t have anything better in their lives to do other than drink and make complete and utter t*ts of themselves. The volume was sometimes unbearable, however (thankfully), we couldn’t hear them when in the bedroom. The restaurant in the hotel was all show… It looked beautiful, with heavy rustic looking tables and chairs, regardless of the beer coasters jammed under almost every table to stop the wobble. The views from the large windows displayed the same wonderful view we had from our bedroom… We quite happily watched the swallows swooping the sand, and the oyster catchers running up and down the shore avoiding getting their feet wet. The food was pitiful. From the very little options on the menu, and from what was available; the chicken was dry, the roasties were too greasy, the gammon was flavourless, the veg was overcooked, the eggs were undercooked, the toast was delicious (but we had to toast our own bread at breakfast ha ha). DO have a drink in the restaurant!